The July 12th launch was SUPER! Jon Ward had a successful Tripoli Level 3 Certification. His rocket Red Robin Fireball flew on an Aerotech M1297 to 6166 feet. This was the first L3 cert flight at SEARS. Chris Short is now a Tripoli Tap Member. There were three Level 1 Certifications. Rob Wilson flew his “Emily Grace” on an H123, Ricky Nikolson flew his PML Callisto on a H148. and Richard Crews flew his Little Dog on a H123. Congrats to all! There were 23 glider flights. Daymon Campbell won the draw from the prize pool. He picked an Estes Eliminator. Alexa Stetson won the Glider duration with a 90 second flight. Her pick from the prize pool was a Quest Bright Hawk. There we several Georgia Tech fliers. Lelia and Demetri had unsuccessful L2 certs but they will succeed next time. Both Lelia and Demetri are aerospace majors and will be on the Georgia Tech USLI team next year. We were spared from the forecasted thundershowers until 4 o’clock. There was one storm threatening but it only cooled the air which was a relief. Another relief was the SnoCone Stand run by Alexa Stetson. I forgot how good SnoCones were. Thanks Alexa! I had requested more launch help. The response was great and appreciated. By the way, Russ Roberts actually likes being LCO and does a great job. There are pictures and videos in our gallery. We enjoyed having John and Sherry Stein back. John treated us to a flight of his R/C Centurian. Jack Kale came for a visit. He is being treated for cancer so keep him in your thoughts and prayers. We will not have an August launch. So build some rockets in the air conditioning. See you on Sept 6th when the event is Scale Rocket Day. Thanks all for making the July Launch a great one! The next SEARS launch is July 12th at Samson and the event is Glider Day. Fly any rocket that recovers as a glider and you will be entered to pick a prize from the prize pool. Use the green flight cards for glider flights. In addition, we will have a Edmonds Deltie B Duration Contest. There will be a pick from the prize pool for the longest Deltie B flight. You can make up to two “for the record” flights. Just announce it is for the record before the flight and it will be timed. 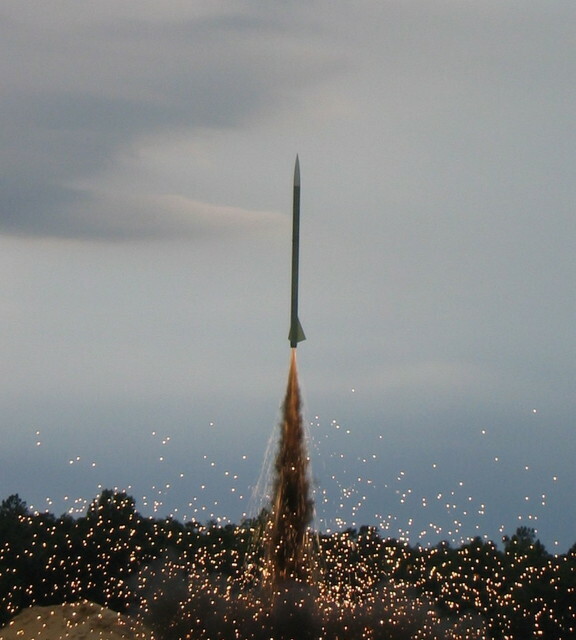 You are currently browsing the SouthEast Alabama Rocketry Society weblog archives for July, 2008.